The palm leaves stand for peace. The gold circle symbolises Africa's wealth and bright future, while the green circle represents African hopes and aspiration for unity. The map of Africa, without boundaries, signifies African unity, while a series of small interlocking red rings at the base of the emblem stand for African solidarity and the blood shed for the liberation of Africa. ^ "Assembly of the African Union: Third Ordinary Session, 6–8 July 2004, Addis Ababa, Ethiopia" (PDF). , p. 15. 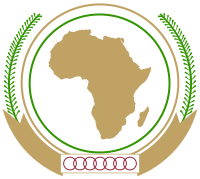 ^ African Union Symbols, AU website.